This past weekend i had the honor/privilege/misfortune (choose your favorite) to find myself in the vicinity of Cleveland, Ohio for my son’s college graduation. Four years at Oberlin and neither of us had ever taken the time to drive 45 minutes to Cleveland to visit the Rock and Roll Hall of Fame and there was just no excuse for not going just once before we bade goodbye to the American heartland once and for all. I don’t think I’m enough of an historian or curator to comment on the museum itself or its various exhibits. But I was struck by one particular element. Not surprisingly, I was looking forward to seeing some iconic guitars and I was disappointed. Not because there weren’t plenty of them because there were. Duane Allman’s burst (and not behind glass either) a couple of Jimi’s Strats and his Flying V, Jeff Beck’s Esquire, one of Bruce’s Telecasters and a few of Les Paul’s experiments (The Log is a repro) and a whole lot of others. Even Johnny Ramone’s beat up old Mosrite was given the same status as these others and perhaps rightly so. But it also occurred to me that these instruments had become rock icons and were really no longer instruments. It seemed a shame to see Hot ‘lanta 2 feet in front of me; it was being stared at, coveted, admired and probably a few other things as well. The one thing it wasn’t going to be was played. These guitars didn’t make the music, the players did and if putting their tools on display is the best we can do, then so be it. I suppose Picasso’s paint brushes would have the same effect on some art aficionados. Duane could probably have played Layla on a R9 (or a Tokai for that matter) with no trouble and it would have sounded amazing. I don’t know whether a museum staffer plays these instruments on occasion to keep them in good condition but it would probably be a good idea. In fact, I’d like to officially apply for the job. Right now. Even if I have to live in Cleveland. I’ve found that old guitars that aren’t played regularly don’t play well or sound very good for a very long time. I bought a 345 that was in a closet for nearly 30 years and it took weeks of playing to get it to “open up” and to feel right again. Wouldn’t it be a shame if these guitars are never played again. I would suggest that they go on tour with a well guarded musician every now and then-maybe Eric Clapton takes Hot ‘lanta out of its exhibit and onto the road for a spin around the repertoire. I’m sure he wouldn’t mind (although the execs at Fender probably would). A guitar is meant to be played and once it becomes something else, it’s not an instrument anymore, it’s a rock icon. Like Elvis’ jumpsuit. BTW, I only saw a couple of 335s-one belonging to Roy Orbison (a black one with a Kahler from the early 80’s) and a Blonde 81 belonging to Chuck Berry. Awkward grammar aside (see title), one of the things that is the most fun about 335s is trying to figure out what was going on at Gibson during the transitional periods. Was there a bin full of necks, bodies and individual parts that workers just grabbed indiscriminately? Would the bottom of the pickup bin in 1965 be a couple of PAFs to far down in the barrel to reach without extra effort? Or would there be an orderly use of parts where the old ones were always used up before the new ones went into service? I’m going with workers grabbing whatever parts were easiest to reach-thus the inconsistency from year to year. I came across an excellent example of this on Ebay today. The auction calls it a 67. Heres a link. OK, what do you see? I’ll start. Serial Number-67. But its very close to a 66. 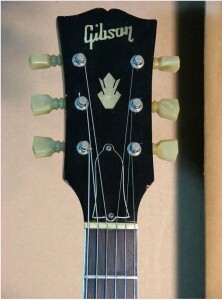 Headstock inlay is in the high position which indicates a 66. Pickguard bevel is wide-really unusual for a 67. 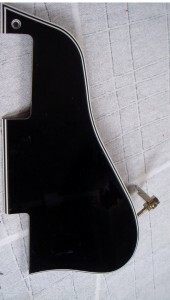 Truss rod cover-narrow bevel-usual for a 67. Witch hat knobs late 66 and later. Pointy horns are correct for 64-67. Compare to this one-also a 67 link. This one also has a 67 serial number but a much later one (although this isn’t always clear-this time it is). Headstock inlay is low like a 67. Knobs are bonnet style not usually seen after 66. Pickguard is narrow bevel which is more normal for 67. Yikes! this one has a wide bevel truss rod cover. The horns are rounder but there is usually some variation during this period-they aren’t as round as a 68 normally would be. My assessment of these 2? I think the first one is likely a very early (January) 67. It’s within around 800 numbers of the cutoff from 66. Was there a wide bevel guard in the bottom of the bin? A 66 style neck buried in there? They were probably still using up the 66 style necks at that time but still mixing the knobs (new style) and guards (old style). The second auction is a bit more clear. Having a serial number that starts with zero is always a 67. No 66 starts with this digit according to Gibson. It’s near the end of this run of serial numbers as well which probably dates it later in 67 although that’s speculative. So, why the bonnet knobs? Well, a lot of people don’t like the witch hats and I’ll bet anything that they were changed. 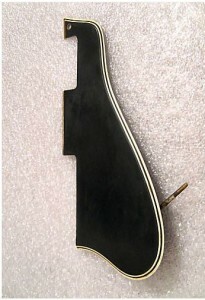 The narrow bevel guard is usual for a 67 but the wide bevel truss rod cover isn’t. Fun, huh? This gives a lot of credence to the big bin o’ parts concept. They are both in very nice condition and not horribly priced, although I think they are still high for this market. Which one would I buy? I’d need to see the back of the pickups to see if the screws are Philips or slotted. Slotted means T-tops Philips means that they might be late Pat# which I prefer. I’d have each seller measure the nut width for me and choose the wider although they are probably both 1 9/16″. 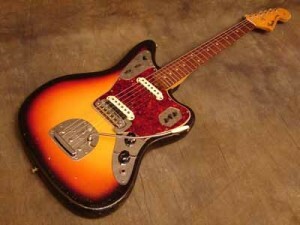 Finally, I’d probably eliminate the second one because the tuners have been changed and I prefer the wide bevel guard. I really enjoy the Sherlock Holmes aspect of 335s. A little detective work will assure you that you’re getting what you think you’re getting. Ultimately, these rules are out the window if I get the opportunity to play the guitars in question. Then I buy the one that plays and sounds better. Supposing one sounds better and the other plays better? Then I have to look at the setup and see if its well done. If they are both well set up and one plays well but doesn’t sound great, then I don’t buy either of them. At these prices, the guitar should play well and sound good. I don’t care what year it is-these 2 factors are deal breakers. I’m encouraged by the number of readers I’ve accumulated in the 2 months that this site has been operational. While I’m no expert in the field of web site and blog construction, I’m learning a lot as I go along. One thing that I think I’m lacking is an effective way to reach out to folks who might need the services of an expert so that they don’t get taken by unscrupulous dealers when they show up with a family heirloom guitar with the intent to sell. I saw a bit of this firsthand over the weekend at a guitar show. 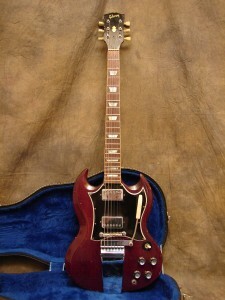 I won’t mention the show or the dealer but I walked in with the same 65 SG that’s for sale on this site. I was told by one dealer that it was a 71 SG and that he felt it was worth $2000 to $3000 but that was retail and he would give me $1800 for it. Most of the dealers said “how much do you want for it” which I think is wrong. If you aren’t a dealer-just an interested buyer, then that same question is legit, IMO. The correct approach for a dealer-and I saw it more than once is “let’s see what you have”. The dealer who opened the case, looked over the guitar, told me what I had and gave me a retail price range and a cash right now offer had it right. Everyone should agree that the dealer needs to make a buck, so you can go ahead and eliminate any dealer who tells you he’s paying you the retail value. On the other hand, if you consulted the internet, the Blue Book and your Uncle Harry who knows about these things, you probably have a retail value in your head which, frankly, you aren’t going to get from a dealer. The advantage of selling to a dealer is that he will pay you a reduced price but he will pay you right now. Today. If you want retail and you’re willing to do the research and list it on Ebay or The Gear Page, then you might get it. Or you might be wrong about the year and the value and get even less than the dealer was offering. One example. 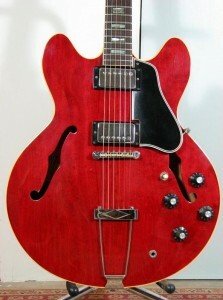 Recently a 64 ES 335 was listed on Ebay with a buy it now of $3000. It lasted 15 minutes and it was snapped up by the first person who realized that the seller missed the value by 300-400%. A dealer would have certainly paid $9000 for it. It was a bit rough, so I would value it at around $12,500 which is what the guitar ultimately went for when it showed up again on Ebay a week or two later. If the $3000 seller needed the cash badly, his best bet would have been a trip to his nearest guitar shop. A no reserve auction would have been a better choice but those can backfire too-especially if you don’t know what you have and you don’t have time before you need the cash. Had this individual been able to find my site and send me an email, I could have given him some guidelines that would have netted him at least 3 times what he got. I’ve notified the search engines and gotten some links up but it seems slow to take hold. So if you read this and you aren’t a collector or a player and you need help with your guitar, send me an email or comment on a listing and ask a question. I’m trying to make this as easy as possible. At the same time, I hope to educate, entertain and spread the word about how great these guitars are. And thanks to everyone who has registered and is taking part. You rock. One of these is worth more than 20 times the other. Can you see a difference? Hint: There 2 obvious ones and 2 not so obvious. Ok, you probably don’t get this reference either. It’s from the film “The Graduate” when Benjamin (Dustin Hoffman) is cornered at a party by Mr. McGuire (Walter Brooke) who suggests that this is the future. It turns out that computers were the future and not plastics but who knew back in 1967. The plastic parts of your ES can tell you a lot. Let’s see, what do we have? Pickguard, knobs, truss rod cover, tuner tips and the switch tip. All have relevance when dating your vintage 335/345/355. 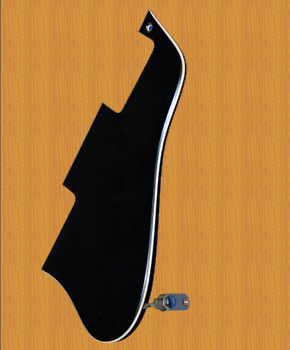 The pickguard went through 3 different iterations from 1958 to 1969 which are the dates we’re most interested in here (in case you haven’t noticed). In 1958 the guitar had what is known as the “long guard” it went well below the bridge pickup, down to the lower edge of the bridge. I like the look but Gibson saw fit to cut it down to the second style which looked similar but stopped at the bottom of the bridge pickup. They probably were trying to save money as usual. It was still a four ply plastic guard with a wide bevel-it was just shorter. This occurred relatively late in 1960. I would guess it transitioned in sometime in the Fall of 1960. The short guard continued unchanged until sometime in late 66. At that time they changed only the bevel from a wide bevel to a narrower one. So, if you have a narrow bevel on your pickguard, you can assume it is late 66 or later. The 355 had a tortoise guard and also followed the large guard small guard timetable. Of course a pickguard can be changed and I never rely on it for a definitive date-I use it as secondary “evidence”. We’ll talk about the primary and secondary characteristics to be used when dating these in greater detail as I run out of generalities. 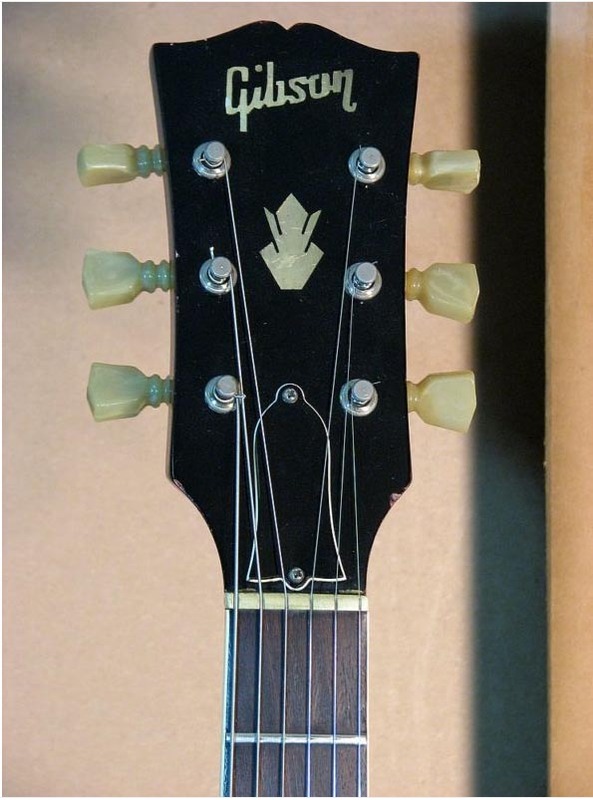 We covered tuners in an earlier post, so we’ll let that go and look at the truss rod cover. There were 2 types and , again, it was the bevel that changed at about the same time the pickguard bevel changed. However the ES 345 has it’s own little quirk. 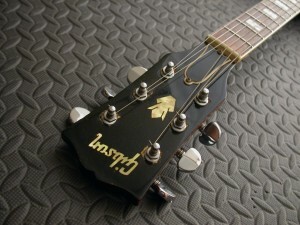 Most 345s had the word stereo engraved on the truss rod cover but I have seen quite a number of 59s that don’t have it. There were no non stereo 345s made unless it was a custom job. So, wide bevel cover from 58 to 64 and narrow bevel from 65 on. As with pickguards, don’t use the truss cover bevel to definitively date your ES because they too can be changed easily. I’m going to do an entire post dealing with the knobs since each era, each color and each model sometimes had distinctive knobs. Finally, the switch tip. There are actually 3 different types that I’ve seen although most will only acknowledge 2. From 58 to as late as early 61, you see the catalin switch tip. 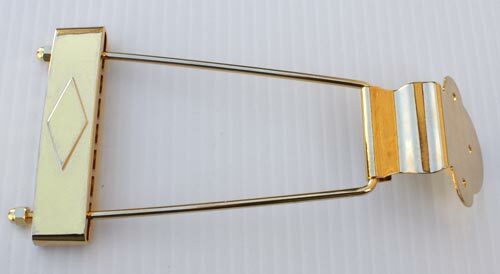 Catalin is a synthetic material much like Bakelite that has a distinctive amber color. Up until recently, these were very valuable since no one had made a convincing reproduction. They could fetch up to $300. Now, a number of companies have reproduced these pretty convincingly and the demand for the originals has dropped. They have no seams and a distinctive slender shape. If yours has one of these, it is likely a 58, 59 or 60. Or it’s been changed. Again, a secondary “tell” since its so easy to change. 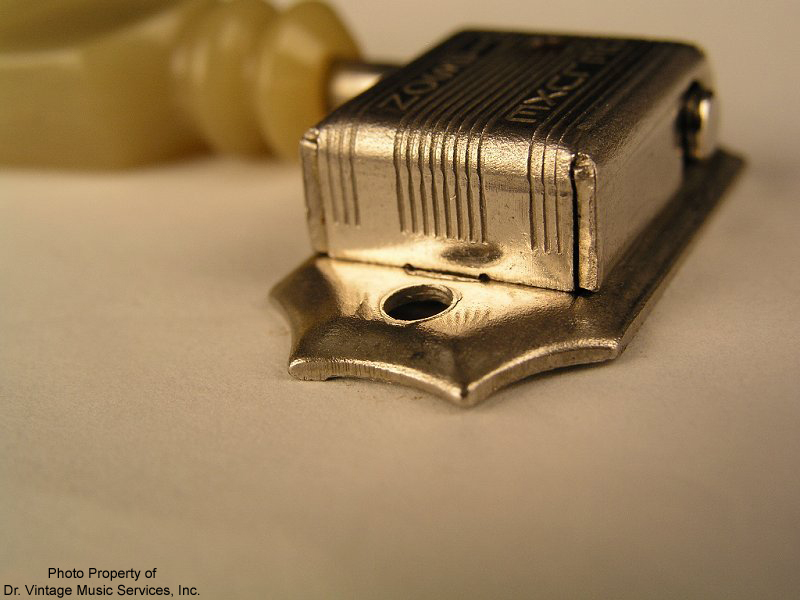 In 61, the switch tip became white and stayed white through the 60’s and beyond. Wait a second, didn’t I mention a third type? Well, I’ve owned more 62-63 and 64 ES’s than any other years and I’ve come across more than a few white switch tips that don’t have a seam. Most have a seam that is circular and wraps around the tip just below the top. I’ve never seen a non seamed white tip after 64. Someone didn’t get the memo. The vintage guitar bubble has burst (get it-burst?). 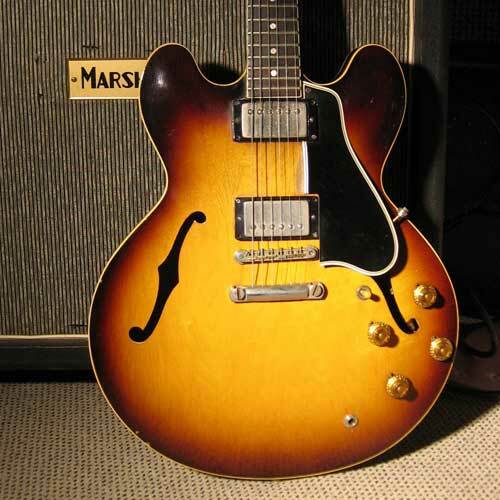 It wasn’t long ago that a mid 60’s ES 335 (66-67-68) would sell for $5,000 or more. Bewilderingly, they are still priced at this level and higher and they don’t sell. If you ask me, folks aren’t lowering their expectations because they don’t understand the market. Or economics. Or supply and demand. Right now, there is a reasonable supply but virtually no demand. So why aren’t prices falling? Simple answer-when sellers need the money badly enough, they will drop their prices. The dealers aren’t helping any either. Their prices are still often stupid high but at least they are usually negotiable. They are businessmen and they won’t survive unless they sell something. This may be the only time in recent memory that you could get a better deal from a dealer than from the general Ebay population. I spoke to the venerable George Gruhn recently about the Pelham Blue Trini Lopez and he seemed to agree that the market is in disarray. The Blue Book, which serves as a starting point for many sellers is, in his words, “all over the place”. 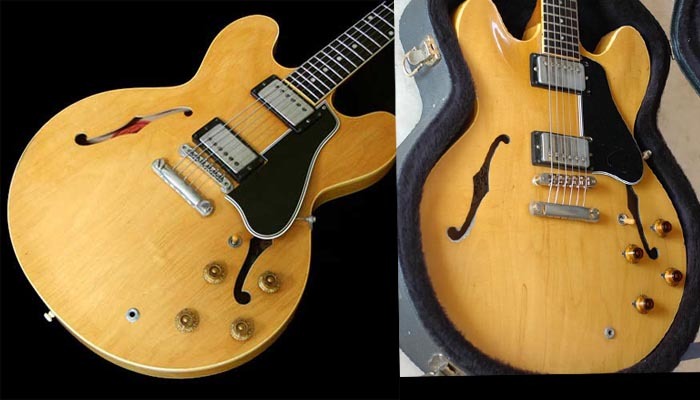 The average Ebay price of mid 60’s ES 335s is well over $6000 right now. There’s a 68 for $9905, a 66 for $8000, 3 more 68s for around $6000, a 67 for $6900. Even at the very top of the market, these didn’t sell for those numbers. I sold a very nice all original 62 for $11,000 about a year ago and the market was actually a little better then. If a 62 is worth $11K and was worth nearly $20K at the peak, then an average 68 should be around $3000. It’s like everybody heard that 60’s Gibsons were worth big bucks and went into the closet or under the bed and slapped on whatever price the most expensive dealer was asking. It may be that many sellers know that these guitars were once worth this much and that these things only go up with time-never down. Like houses (LOL). Many are mis-dated. Many have changed parts. Nearly all are overpriced and nearly all think they are going to get what they’re asking. I know…I email them to discuss whether they really want to sell their guitars. I can pretty much guarantee that none of these will sell at these prices. This standoff between increased sellers and diminished buyers probably won’t end until someone blinks or the economy improves. 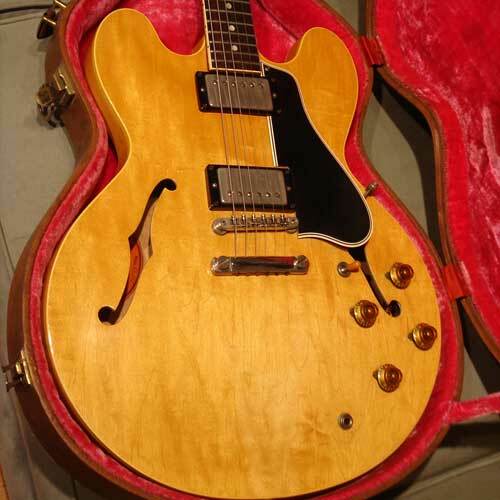 Don’t get me started on blonde 335s from the early 80s at $5000 or more. Yikes. Too Hung Over to Write? This weekend, I was visited by the former keyboard player (and his wife) from my old band (40 years ago) from High School. The band was called Sanders Mansion after a well known historic house in my home town. The house was called (I don’t want to make this too difficult), uh, Sanders Mansion. Built in 1708, I think. The house, not the band. Anyway, we were a pretty big deal for a local high school band back in 67-70 or so. We played all the usual venues-sock hops in the gym and, later, frat parties at the local college (Union College in Schenectady). The occasional bar gig and the occasional pool party were the two far ends of our performing range. It’s nice that we stay in touch and whenever we see each other, which is not frequently enough, we always wind up reminiscing about our gigging days. We probably played only 150 gigs in our short history but it was twice a week for a while along with the usual high school silliness. I, like him, was a lot more interested in the band than I was with my studies. This really has nothing to do with ES 335s or guitar collecting but it has everything to do with the things that make life worth living. Good friends, good music (we both still play) and good memories. Sometimes the memories are even better than the original event. I consider my time playing guitar in front of people to be one of the high points of my life and while it doesn’t define me as a person, it is always with me. Spending an evening eating, drinking and reminiscing with someone who has that same history is a great joy. Our wives get along great and they don’t even mind it when one or the other of us sits down and plays something. 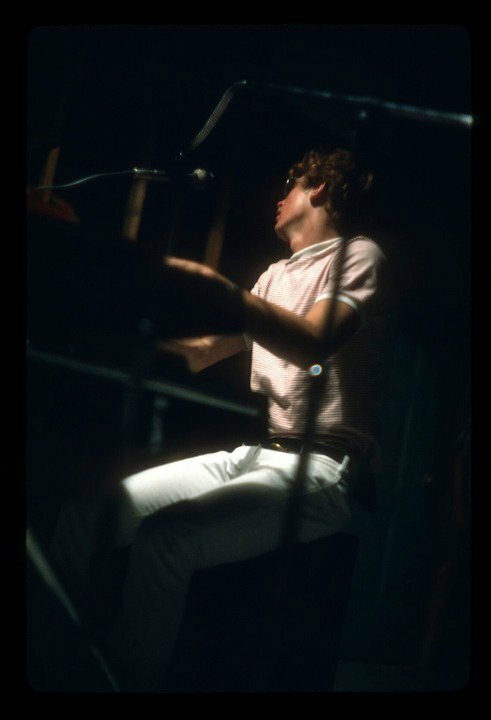 My good friend Tom at the Vox organ in 68. The B3 was a year or so away. I sold it, which really annoyed my father and bought a used 63 ES 330. I played that guitar all through high school and loved it. Yes, it would feed back if you faced the amp but still, it had a great neck and great tone. I had a Vox Royal Guardsman (cost $600 which like $3000 today) for a while and while it looked very cool, it sounded like crap and broke all the time. So, I sold that and bought a used Fender single Showman for $200. As a big Cream fan, I wanted to sound more like Clapton and I needed to get that “woman tone” I was so taken with. He was playing an SG (“The Fool”) at the time and while I didn’t go for the psychedelic paint job, I loved the tone. 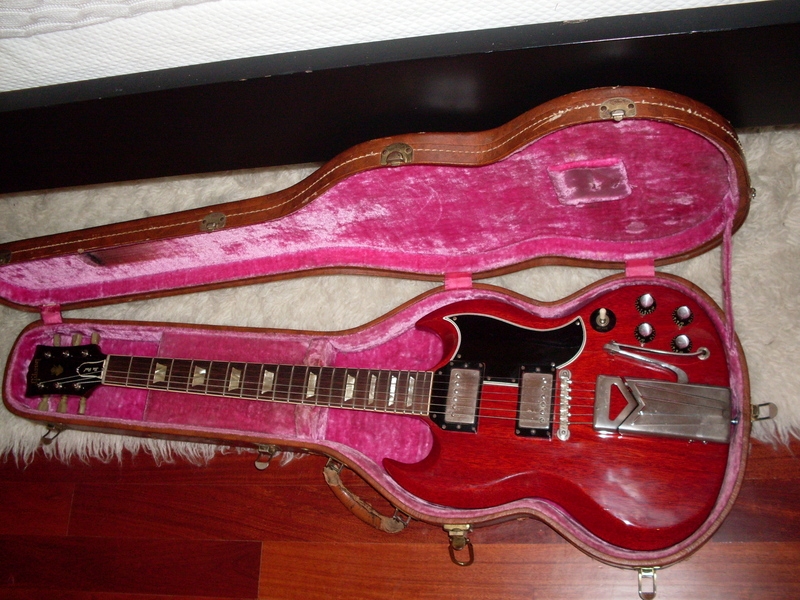 So, in late 68, I bought a brand new SG. I couldn’t even afford the case for it, so I carried it in the cardboard box it was shipped in until I could. Damn thing never got set up right and I learned all about intonation from it. Mostly because it wouldn’t intonate. I was pretty discouraged with the SG. It sounded great but I was bending notes just to get them in tune as I went past the seventh fret or so on the B and G strings. It did a lot for my ear and might have even helped my playing but I couldn’t wait to get rid of it. I wanted my 330 back. Then I heard about the 335-more or less a 330 with humbuckers-I could have the tone I was after-without the feedback- and the shape and feel I was used to.It was too much money-I just couldn’t afford it but, as luck would have it, bass players were in short supply and our bass player was really a guitarist and he often brought his Epiphone Riviera to gigs and I started playing it. That was in 1969 and that was the beginning of 40 years of 335s-and it wasn’t even a 335. The point is that the right guitar has to speak to you. It has to feel like an extension of you and you have to have a relationship with it. Once you find out what guitar that is, then you can look for the right 335 or the right Tele or the right Les Paul. That’s the fun part. I’ve owned a lot of non 335’s between 1969 and now-I had a Mosrite while I played in college that looked much cooler than it sounded and I had a Hamer in the 70’s when Gibson and Fender were turning out crap. I stopped playing for a number of years while I built a career and a family but started again when my son was born in 1987. I had kept the Hamer and a Martin D-28 in the closet along with the Fender Princeton that my father had bought with the Duo Sonic in 1964. In fact, the Duo Sonic was still at my parents house and I got that too. That was the beginning of the collecting part. I bought a lot of guitars in the 90’s and got my son into playing. He became a better player than I am and had his choice of a lot of my guitars to play. What did he pick? The Stratocaster. He says he likes the 335 but he likes the Strat better. He still has my Stratocaster and I’m guessing that I’m not getting it back. My perfect guitar? 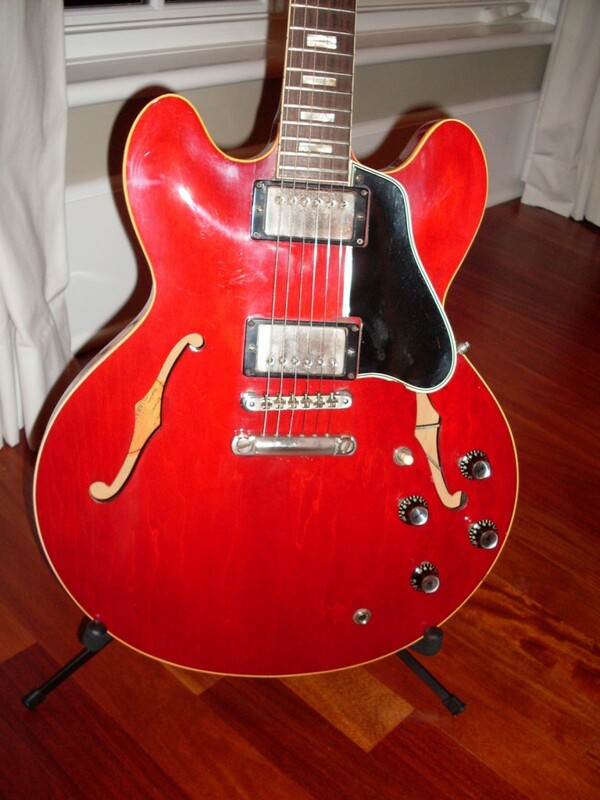 I still haven’t found it but I know it’s a 64 ES 335. I’ve had a half dozen of them and it’s as close to the perfect guitar as I’ve ever been. 64 335. Mr. Goodaxe and then some. OK, some of you are probably way too young to get the joke. It seems there was this cartoon character in commercials for Starkist tuna (tuner, get it?) named Charlie the Tuna. Being named Charlie meant that everybody, for years, would call me Charlie Tuna or would use the “Sorry Charlie” line on me. Well, Charlie (the tuna, not me) wanted to be caught and eaten so he tried to show good taste by doing things like reading Shakespeare or learning to sculpt or something like that. Well, the punch line was “Sorry, Charlie, Starkist doesn’t want tuna with good taste, Starkist wants Tuna that tastes good”. So now I’ve used up 100 words just explaining the joke. OK, tuners. The stock tuner on a 335 was a Kluson with a “keystone” tip. Same with the 345, only in gold and the 355 got one of 2 types-either Grovers or Kluson Wafflebacks. We’ll leave the 355 out of it for now. 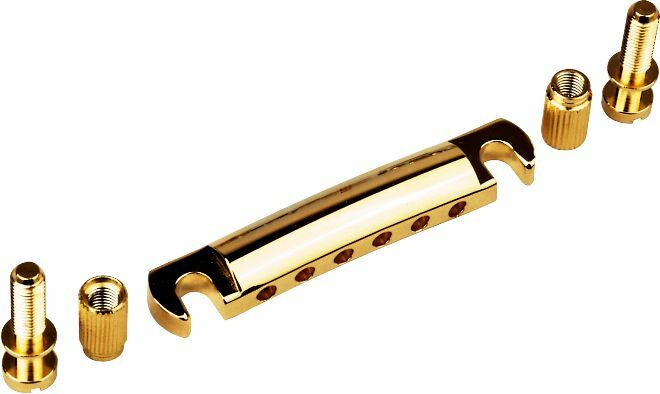 Tuners are a pretty good way to identify the year your guitar was made because they changed the design frequently. The problem is that Klusons aren’t especially good tuners and performers changed them for the more precise, better holding Grover in droves as the Klusons wore out, got bent or they just got tired of retuning their guitars every song. 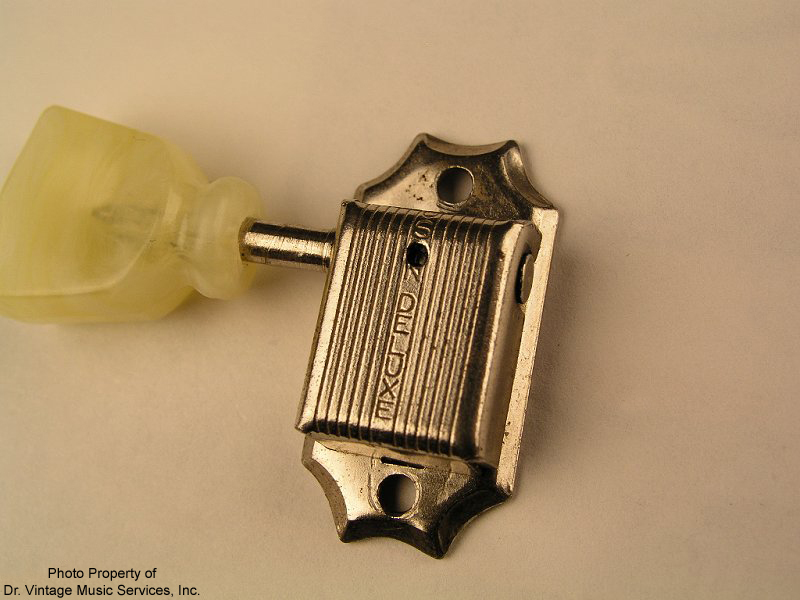 But, if the original Kluson is still on the guitar, you can tell a lot from its appearance. Guitar experts talk about single line and double line and single ring and double ring. I had no idea what that meant for the longest time. It’s pretty simple. Single line means that the word Kluson Deluxe in written in a single line down the back of the tuner. Double line means there are two lines of copy running down the back. Single ring refers to the plastic keystone tip. If it has a single ring at the base of the keystone shaped tip, it’s (duh) a single ring. Double ring? You got it. So, from 1958 to early 1960, the tuners were single line single ring. In early 1960 they added the second ring (which I like the look of better). That lasted until 1964 and maybe into 65. 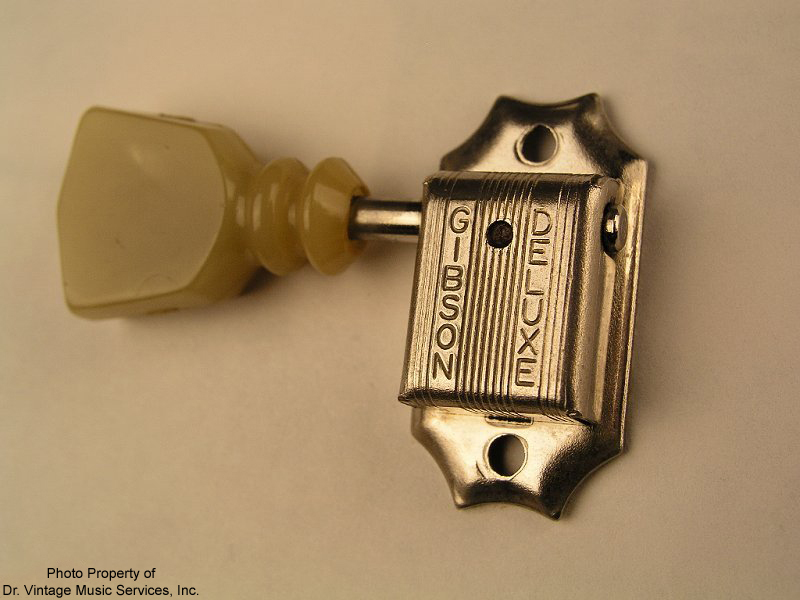 At that time, they added the second line of text on the back, so we see double ring, double line from 1965 through sometime in 1969 when they changed the wording on the back from Kluson Deluxe to Gibson Deluxe. There are a number of sub-variations, like patent pending and patent number and various oil hole locations, especially on the early ones. A good place to get educated in the real esoterica of tuners is at Doctor Vintage’s Site HERE. I hope the good doctor won’t mind if I borrow his impeccable images. And if he does, I’ll find others. Thanks Doc. We’ll get into Grovers in another post. They became stock on the 81 Dot reissue and are still used today on Memphis ES-335s. 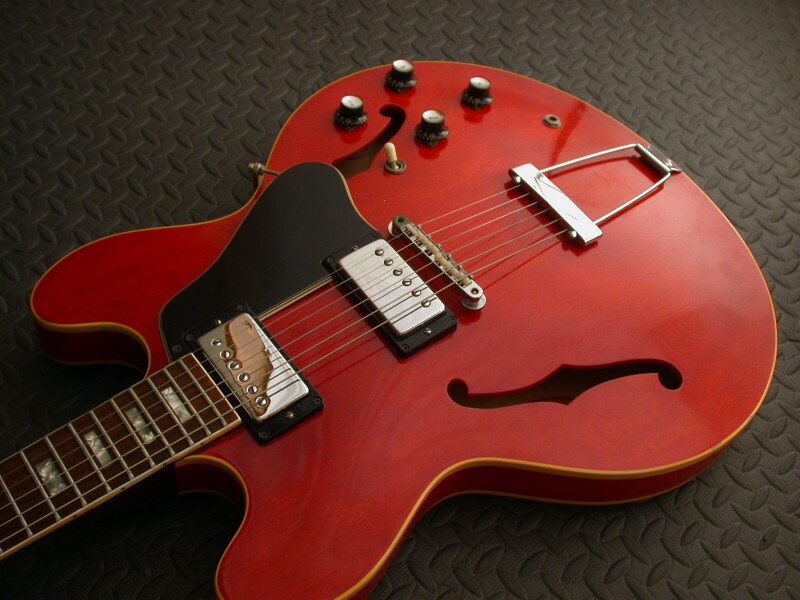 The Nashville 335s (Historic) still use the good old Kluson , although they’ve been improved and the company was bought by Tone Pros a couple of years ago. Much as I like to write about arcana like stop tails and PAFs (it’s like another language! ), I also like to write about the guitars themselves. Then I get to use terms like “tone for days” or is that “sustains for days” or “tone to da bone”. 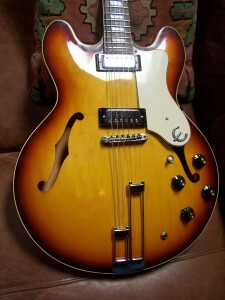 Anyway, pimply faced hyperbole aside, the 59 ES 335 was every bit of that and then some. Ask any Gibson aficionado-especially the Les Paul guys-what year was the pinnacle of Gibson’s Golden Era and most will say 1959. And with good reason. As far as 335s are concerned, a 59 has everything you could want in a 335, 345 or 355. Most of us like a big fat neck profile and the 59 has that in spades. The measurement at the first fret (depth) is usually in excess of .90 inch. The nut width is pretty consistent at 1 11/16″ which just about everybody likes. There is, however, a pretty big variable in the overall profile since a lot of handwork went into these. Of the dozen or so 59s I’ve played and the 4 I’ve owned, no two were exactly alike but they were all great. Tone? You want tone? Long magnet PAFs while wildly inconsistent can be spectacular. A bad long magnet PAF is a rarity and some of the good ones are so packed with overtones and harmonics that you’ll swear there’s reverb when there isn’t. 59 was also the year that you find double whites under those covers-not that I advocate taking off the covers but it’s nice to know they’re in there. The 59 is, of course a dot neck which has it’s own special appeal. I use the screen name “Red59Dot” on some of the forums because I’ve been searching for that guitar for years. Gibson says it doesn’t exist but there are at least 2 that have been documented. I had one that was sold to me as a 59 but it turned out to be a later guitar that had a replaced fingerboard. It was still a great guitar but it wasn’t a red 59 dot. My search continues. The color choices in 59 were sunburst and natural. Most were sunburst-the shipping totals show 521 sunburst and 71 naturals. The totals for 345s were 446 sunburst and only 32 naturals. The 355 was only available in red. The 59s are big money guitars and rightfully so. The rare naturals have sold in the near $100,000 range at the top of the market. Natural 345s have approached $50,000. On the other end of the scale, you can get a 59 345 for around $10-12K if you’re willing to overlook a few issues (I’ve bought 2 in that range) and 355’s are the deal right now. There seem to be a lot of them in the marketplace with asking prices all over the place but I’ll bet they aren’t moving until they get to the $10-12K level. That’s a lot of guitar considering they were close to $20K not too long ago. And the sunburst dot neck 59? It’s still usually over $20K for one with minor issues and well above that for really excellent examples. The 59 dot neck is not for the faint of heart. 59 Dot neck in Sunburst. 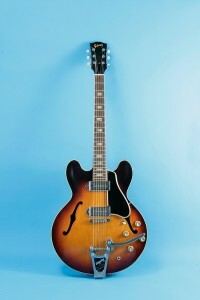 Also from ES-335.net. Note the long pickguard. They only did that from 58 to 60. I think they are very cool. No, it’s not the latest Japanese monster horror movie, it’s two distinct ways to mount strings on a 335. 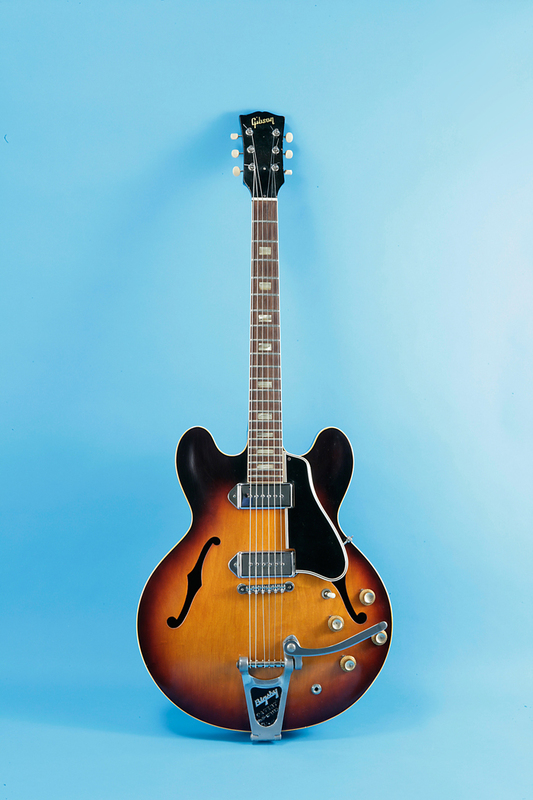 From 1958 to early 1965, all 335s and 345s either came from the factory with a stop tail or a Bigsby (Vibrola, etc. )Part of the idea of a semi hollow guitar was to capture some of the qualities of a solid guitar, most notably, sustain. Everybody wants their guitar to “sustain for days” as the ads always say. By anchoring the strings to a metal bar that is set very deeply into the solid block of wood that runs down the center of your 335, you are able to take advantage of the resonant quality of solids-specifically wood. Try this sometime-while playing your electric guitar without the amp and sitting in a wooden chair, lean the body against the chair so that the chair picks up some of the resonance from the guitar body. This is very easy in a big wooden armchair. You’ll hear the guitar get louder and probably hear some added bass tones. Pretty cool. Physics 101- a solid transmits energy in the form of sound waves better than a liquid or a gas which I guess explains why a solid body guitar actually works. So, why did Gibson stop using the stop in 1965? Frankly, I have no idea but I’m guessing it had something to do with the number of steps involved in the manufacturing process. For a stop, you have to drill the holes, insert the sleeves and thread in the studs and the tailpiece. For a trapeze, all you have to do is drill three little holes and screw it in. But there’s a problem. The trapeze basically allows the string to be suspended in thin air above the guitar top. The only connection it has with the guitar body is from three very small and very shallow screws. The stop tail studs go more than an inch into the guitar and they are essentially big, fat screws. The trapeze is held by little teeny screws that don’t go much more than a quarter inch into the bottom of the body. That’s why you get a different tone from a stop tail than you will from a trapeze. The body doesn’t get to vibrate as much with the trap. You could argue that perhaps the strings are a bit freer to vibrate above the hollow portion of the guitar and that probably changes the tone in other ways. When these little tonal differences and sustain differences are amplified you would expect to hear them more clearly. Well, I can’t. I can perceive a difference in sustain with a stop-which I prefer- but the tone? It’s pretty close. 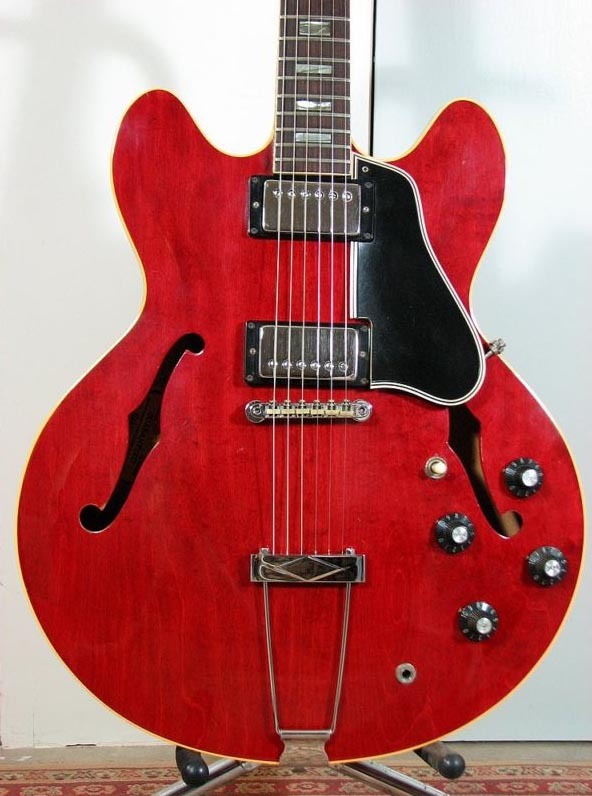 I don’t think I would drill a nice 66 ES 335 for a stop if it sounded good with the trapeze but I wouldn’t hesitate to buy one that someone else had done as a player. I also like the way the stop looks better than the trap but that’s pretty subjective. 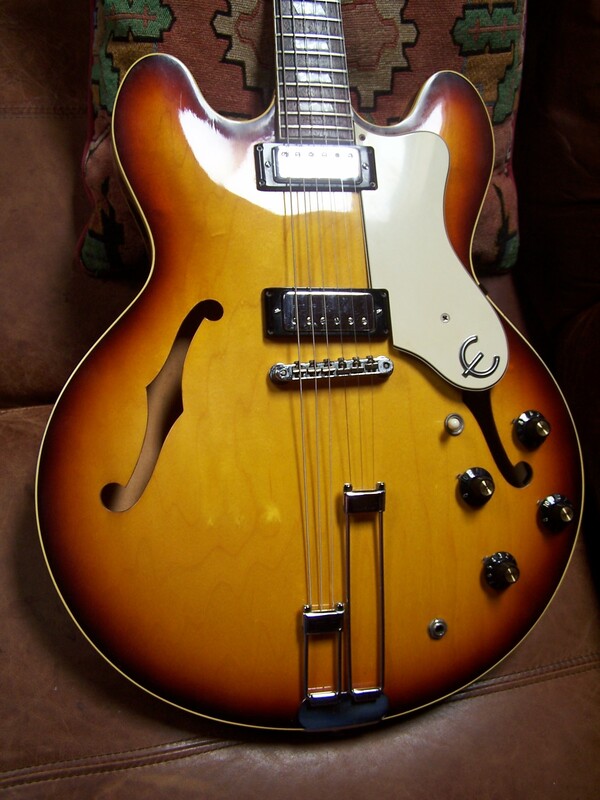 The fact that I’ve never heard of anyone putting a trapeze on a 58-65 ES 335 tells me a whole lot.